Update 1/22/2018: About 2 1/2 years later, this install is still working great. I did have to get a different windshield mount for the control head, but otherwise it’s been great. I’ve been expecting to get a new vehicle and didn’t want to install this twice, so I haven’t had it “permanently” installed in a vehicle yet. Yesterday I completed the install in my Yukon and I’m very happy with it, so I thought I’d share what I did in the hopes that it may inspire someone else. And, seriously, it’s a sweet little radio. A bit pricy (a lot pricy), but a sweet radio. I normally like to install a NMO mount in a hole in the center of the roof of a vehicle; this isn’t as dangerous as it sounds if you’re careful and I always use some RTV silicone to be safe. In this case, though, I can’t get in my garage with the Yukon with an antenna there so I used a lip mount instead. 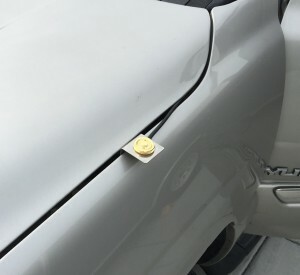 There are lip mount brackets that are designed specifically for the Yukon that don’t require new holes, but I already had this one (and the NMO mount) kicking around so I declined to spend more money. 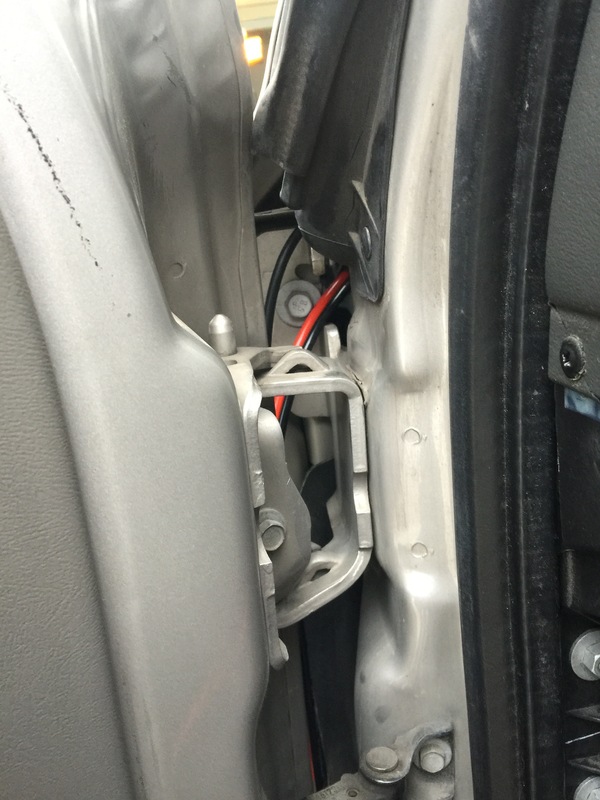 To start with I never trust the accessory power lines on any vehicle. That’s probably ridiculous on newer ones, but I’ve known a lot of people who had trouble with it eventually. I run my own line. On the Yukon (probably all GMC and Chevy trucks in the ’99-’06 year range) it’s non-trivial to connect to the terminal at the battery like I prefer to, but there is a red “+Battery” box thing that is the first stop for a really heavy gauge wire. Good enough! When I opened it I found a heavy bolt with a nut; I added a 10AWG fused jumper wire to it (with the fuse removed for safety) and went looking for ground. 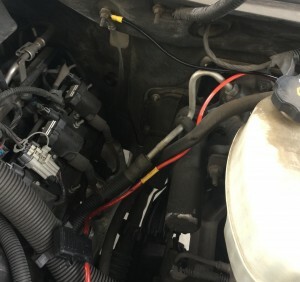 Ground took me longer to find (though I suppose anywhere on the chassis would technically work, I prefer not to take chances), but eventually I noticed a thick braided wire going to a bolt high on the firewall. This is a classic “ground” type wire, so I figured it’d work and hooked my black wire up. 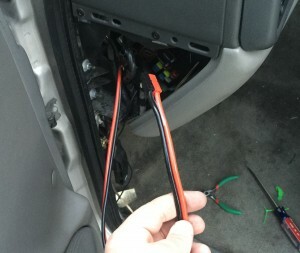 I used an inline crimp splice to attach the red wire to the fused jumper and my connection to the battery was complete. 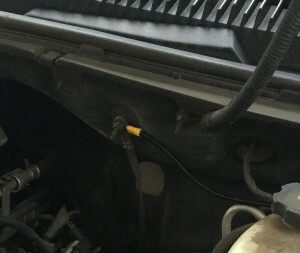 I made sure to have the wire go lower than the grommet and then come up and through so if any rain water gets to it (which is likely) it will not end up using the cable to get into the car. Note that your coax will probably not make it through this if you have a connector on it; you’ll have to run it without a connector and then put one on when you’re done. The ID-5100 is one of few radios I know that always uses a remote control head; it doesn’t even come with a way to mount the control head on the radio. For my purposes this is perfect, though. 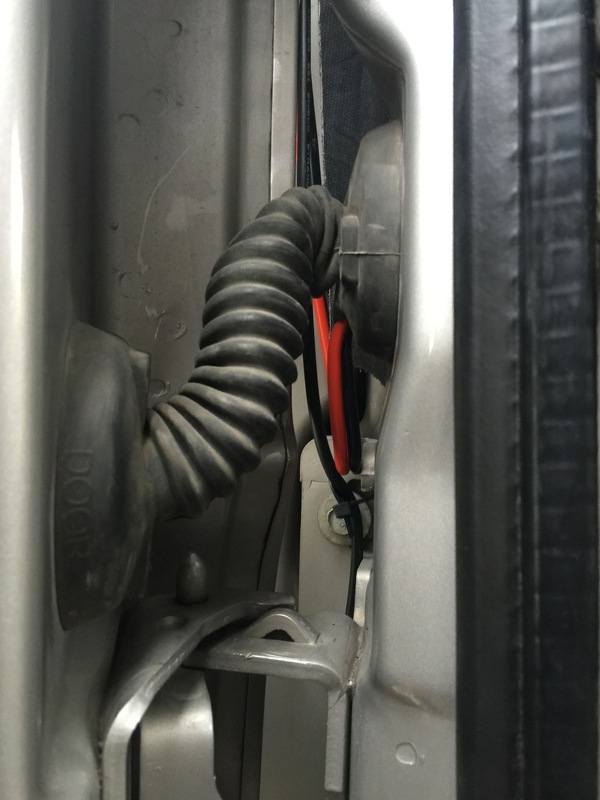 There is a space above the drivers side rear wheel well where you can store your tire tools (jack, wrenches, etc). 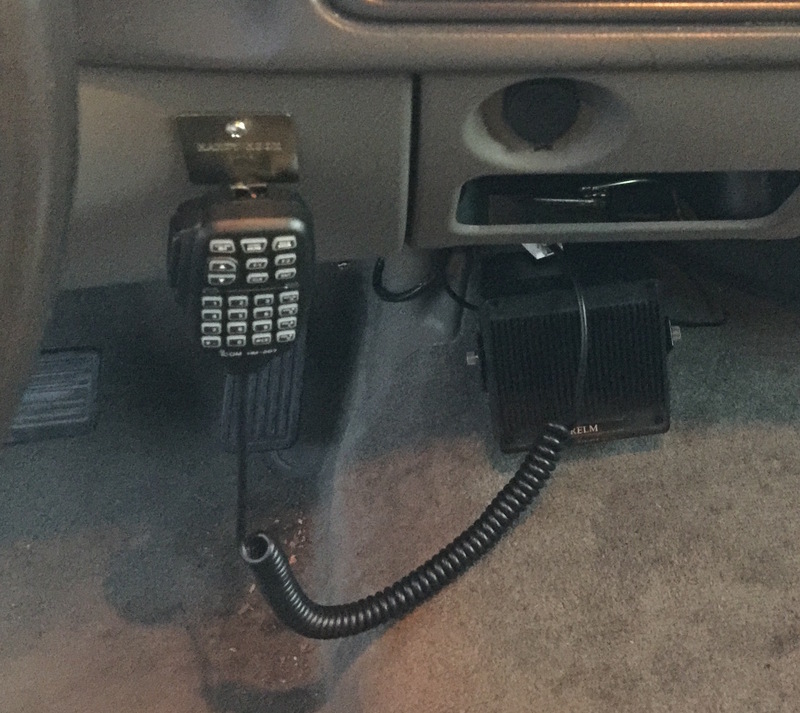 This is where I opted to put my radio. I popped the floor trim up and ran my coax and power back into there; I also ran a 6 pin modular cable for the control head, a 3.5mm extension cable for the speaker, and a cat6 ethernet cable for the mic. 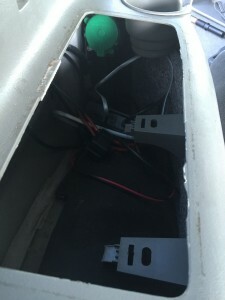 10AWG is a bit much for running under those floor trim pieces so I actually ran 12AWG individual wires back there; I want the 10AWG in my dash so I can use it for other things as well, so junctioned them in there with 30-amp Anderson connectors. In the back I connected the radio up and stashed it in the wheel well. It is uncertain if there will be enough airflow there, so I’ll have to keep an eye on it for awhile to make sure it isn’t overheating. 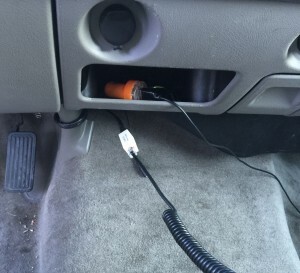 I ran the speaker extension cable and the cat6 mic cable up along and then took them under the carpet at the drivers feet and out in the middle under the dashboard. I used a cat6 barrel to connect the mic. 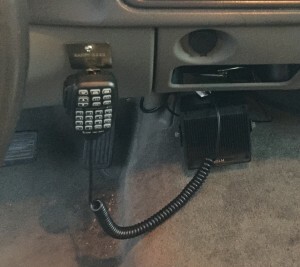 I then mounted the speaker to the floor as far back as I could and added a mic hook to the dash. 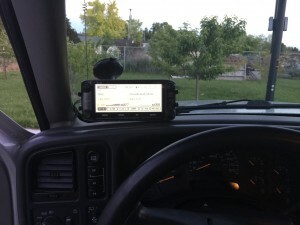 Finally I used a generic window mount to attach the control head to the windshield to the left of the steering wheel. Edit: the generic mount broke, so I invested in a LIDO mount which has been a great replacement! I really like this location as it is very easy to see but out of the way. I ran the 6-pin modular cable through the dash as much as I could so it only just barely sticks out on the left side of the control head. All in all, I’m very happy with it! 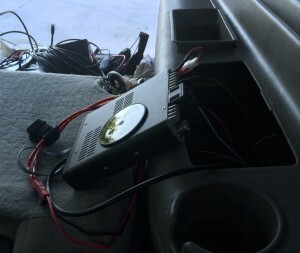 5 Responses to "Icom ID-5100 in my GMC Yukon"
Chassis is always ground, any point will work. 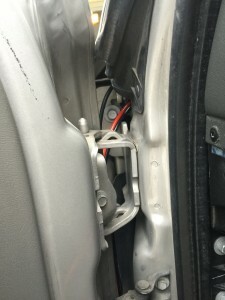 Battery is usually terminated to chassis on the negative side to begin with. You don’t want to do it like that for radio usage. 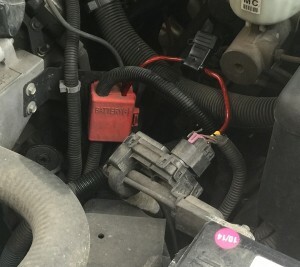 I ran an 8-2 AWG cable from the vehicle battery (DieHard Platinum Size 65 battery) to two 30 amp circuit breakers mounted on the firewall, one each on both the Pos and Neg legs, then through the firewall to the power distribution box, with SPST switches and an appropriately sized fuse (on Pos side only) for each radio. 100% reliable, redundant safety, reduces possibility of some (temporary) AC from the alternator getting to the radios as the engine starts. Yes, I have the radios on while starting the engine sometimes. Voltage drop is negligible, and within operating voltage limits for the radios.